Any space over 400 sqft. Thank you for visiting our website and considering Chester County Carpet and Flooring for your next carpeting, hardwood or Vinyl project! Whether you’re buying carpet or flooring for the first time or it’s been a few years since you last replaced your ANY flooring or carpets, you probably have lots of questions. Either way, we want to help you and with our expertise we will help you find the right answer to go with your home. We are a family owned business. And as such, the quality and value of any job or project that we undertake, reflects on us directly. That is why we take such care of our clients. At Chester County Carpet and Flooring we are a full service expert at all types of flooring. We have 25 years of experience and have been in business since 1996. We take pride in our superior workmanship. We are Home Advisor screened and approved with a top 5 rating and an elite service award and are listed on Angie's List. We consider quality as JOB ONE! Not only of the carpet or flooring that we sell, but of our superior work, done in a professional manner. We are in the peace of mind business and we will do whatever it takes to bring you peace of mind in any job that we undertake. Our professionals will be on time, get the job done in remarkable time, clean up afterward and give you decades of pleasure. We respect your home and treat your home just as we would treat ours. It doesn't matter whether we install a beautiful, plush carpeting, or a durable, easy to clean hardwood, laminate, or vinyl floor. Before we leave, you will be delighted with all aspects of your new look. We offer factory warranties on any carpet or flooring and guarantees on our expert installation. For low priced, high quality carpet and flooring, look to Chester County Carpet & Flooring Co. Call today for an in-home appointment and let us bring our showroom to you. We bring the samples to you - although we welcome you in our showroom - no need to have to travel if you have special requirements or special lighting and color integration concerns with your unique decor. We aim to accommodate our clients with convenience! 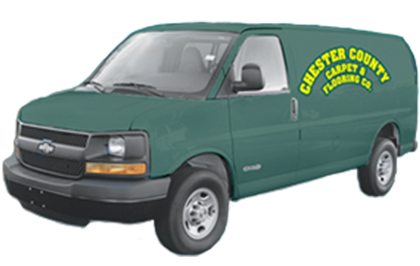 At Chester County Carpet & Flooring Co., we take price in customer satisfaction and our supervisor service. With more than 25 years of experience, exceeding all of your carpeting needs is our specialty. Call us today at (610) 558-9940! !